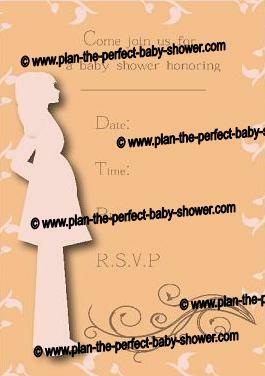 You will not find a more adorable, personalized baby shower pregnant invitation online than this stylish silhouette invite! We are excited to bring you this unique invitation, designed exclusively for our website. It is free, it is printable, you can personalize it with your own details. And it is yours for your PERSONAL use! 1. All you need to do to get this free invitation is sign up for our free newsletter! Just click here to sign up for our FREE email newsletter. 4. Click here (or on the image below) and enter the password at the prompt. *Note: We have started to ask our readers for their email address to grant access to our free invitations because many of our free baby shower invitations have been copied, plagiarized and stolen by other websites. This is very unfortunate and we thought about not posting any additional free invitations on our site, but we didn't want to hurt our wonderful readers because of the poor actions of a few. So we decided to make our free invitations accessible by password. This way we can keep on creating new invitations and posting them for your very own use!! Here is a precious pregnant silhouette baby shower invitation for you to print out, add in your own words by deleting any of the text below and fill in with your personal babyshower details and print as many as you need for your baby shower! This design requires a lot of color ink, so it would be best to save this file to a thumb drive and take it toa Kinkos or Staples to have it printed professionally and inexpensively! Cut them out and you are ready to mail them out. Hope you enjoy them! !